Over the last two years, we’ve heard from a number of pastors, priests, and worship leaders who are on a similar journey–dreaming and experimenting with ways to align historic Christian practices with the modern world. It’s been deeply inspiring to hear what they are learning, and share about The Practice community. In this spirit, we’ve decided to host a small gathering where we pastors can deepen our “unforced rhythms of Grace” (guided by Fr Michael), and dream together about inviting our churches into this way of aligning our everyday lives with Christ for the sake of the world. February 14-16, 2015 at Bellarmine Retreat House. We’re really excited! 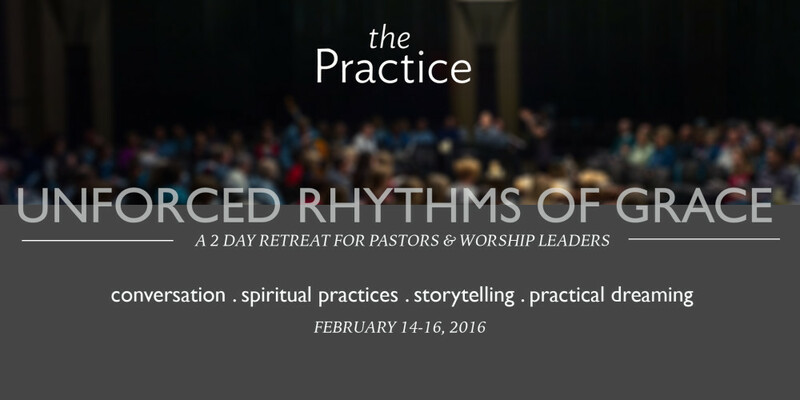 February 14-16th, 2015: Two days of unforced rhythms of Grace. The Living Christ invites us to follow him into unforced rhythms of Grace for the sake of the world. But the reality is, many of us in ministry don’t always live these unforced rhythms of Grace, and we’re not helping our communities live them either. Right beliefs are important but can only take us so far; we need to learn how to put Jesus’ invitation into practice. Join us for two days of conversation, spiritual practice, and practical dreaming about what it means for us to each live our lives aligned to Christ in every moment, and help our church communities do the same. •Monday 2-5 – Group conversation: How do we live unforced rhythms while in ministry? •Tuesday 9-12 – Group conversation: How do we invite our communities into unforced rhythms? What are the most helpful practices? How can our liturgy both ground and stretch us? What would it look like for a church to be a gymnasium for spiritual formation? What can we learn from the other Christian spiritual traditions? How does our inward journey launch us into action for the sake of the world? The cost is $250 per person — which includes meals, lodging, and everything except travel. If you are a pastor, priest, or worship-leader, please join us! We’re really excited to see what God will do within us, between us, and in our churches for the sake of the world.